San Francisco (March 1st)-The first large scale multi discipline exhibition by Brad Bernhardt is coming to the CELL, also known as CELLspace, on March 24th for one night only. This genre bending show will include a focused selection of over 40 paintings, 3D installments, and 5 live DJ sets from local legends, including Syd Gris. The event will cost $5, and the first 30 people in the door will receive a complimentary original print. This blend of art and music will infuse the concepts of gallery and nightclub into an explosion of colors and sounds to enlighten the senses. The exhibition is not just a simple art show: it is much more complex than that. It is a movement, a kind of enlightened way of thought expressed through paintings on canvas, a street sticker campaign, 3D installments, and primal, hard-hitting sounds. The work is meant to unmask what we truly are: primal beings trapped inside a world that rejects us. 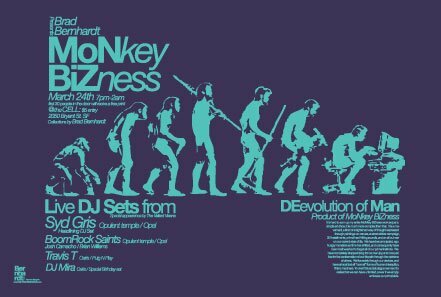 The intent of the MoNkey BiZness collection is to unleash the primal being trapped deep within us, so that we can evolve and reach our full potential as human beings. Brad Bernhardt is a West Coast based visual artist currently residing in the San Francisco Bay area. He has been involved in many exhibitions, including his spring 2010 show “Weapons of Mass Consumption” that was featured in Las Vegas Weekly and the Las Vegas Informer. He also created over 40 signature works displayed on the popular television series the Ultimate Fighter, some of which were featured in the October 2010 edition of Maxim Magazine. He received a degree from the University of Nevada, Las Vegas, and has been working in the art and design worlds for the past 5 years creating a visual style all his own. ← 2 Op Collective is born!